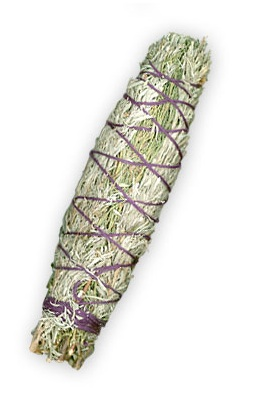 Sage Cedar Lavender Shaman Smudge Stick Measures 6". Sage and Cedar grow at high altitudes and carry the energy of clarity and strength which is released when burning. They transform negative vibrations and recharge space with new energy. Lavender grows in warm, dry climates. It is balancing, refreshing, soothing and grounding. For centuries smudging, the burning of aromatic herbs, has been practiced among Native American to purify objects and locations. Smudge wands are sustainably harvested by Native Americans, with great care and respect for the environment.